5 E-Bikes on Test: Which is the best Shimano Steps powered Carbon E-Trailbike? Fox 36 E-Bike Optimized Forks: What’s the deal? Pendeln ohne Rucksack oder Transport-Tasche? Eigentlich nicht möglich! You live outside town, but have a job in the city centre – unfortunately you have to commute. More and more people are riding in to work every day. One of many reasons for us to take a closer look at the gear we can recommend, and think about tips we can give you for a safer ride. Read on in our Urban Special! When we chose our test bikes, our main criterion was functionality in an urban environment. On your daily commute to work you’re not so worried about the all-out performance of suspension, tyres or the drive train. Instead functional features become more important. Mudguards, a bell, quick rolling tyres, integrated lights and value-added details were the kind of things we were interested in seeing. Of course, the bikes also had to be up to date and use the newest technologies. Thoughtful, well considered design and lots of fun to ride – the Specialized Turbo Vado is an impressive package that should fulfil every need for the daily commuter. There are a few minor points that we would improve – for example the cable routing – but nothing that really detracts from the quality of this bike. You’ll be happy with the Turbo Vado, and your commute will transform from a chore to a ride you look forward to every day. This mini E-Bike seems tailor made for commuting. It doesn’t matter whether you’re riding over tarmac, cobbles or even taking the train – the Winora Radius is happy everywhere. This extremely manoeuvrable and robust E-Bike is well finished with a lovely matt black frame and Yamaha PW motor. The component selection is perfect for tight urban spaces. Whether you’re in New York, Shanghai or Frankfurt, you’ll be happy everywhere with this bike. The Stevens E-Lavena, fitted with the new Bosch Active+ motor feels as un E-Bike-like as an E-Bike can feel: exactly the right amount of assistance from an extremely quiet motor along with great decoupling when the motor isn’t engaged. Combined with the appropriate, durable components, this E-Bike is almost perfect. Our only niggle – the non-integrated battery. If you’re looking for an E-Bike that feels “natural” but will get you quickly from A to B, then the Stevens E-Lavena will be perfect for you. You’ll be moving quickly on the HNF Heisenberg XD1 Urban – very quickly. In normal traffic this E-Bike shines, and you always feel like you’re part of the traffic and never holding it up. It’s completely possible to keep up with the flow on this S-Pedelec. The Gates Carbon Drive coupled with the Nuvinci hub gear are beautifully quiet and let the non-maintenance inclined breathe a sigh of relief. 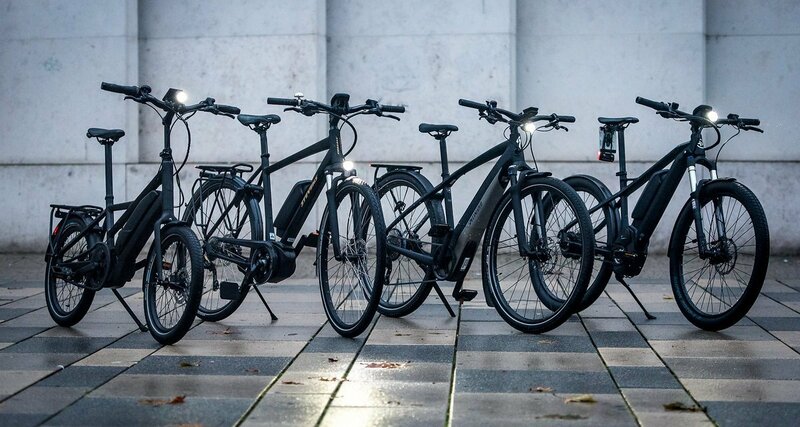 If we ever happen to need or want an S-Pedelec, the HNF Heisenberg XD1 Urban will be on our wish list. Thanks to new technologies and stylish designs, with or without a helmet doesn’t even figure anymore. Always take it – there’s no debate or excuses. If you’re out on your e-Bike then use your helmet. The models we’ve looked at show what it’s possible to integrate into modern helmets. Headsets, indicators, adjustable ventilation, thoughtful designs – every taste and use-case is catered for. Go here for a more detailed look at the different helmets we tested. # Commuting without a rucksack or bag? Basically impossible! Bags are the bread and butter of commuting. A rucksack needs to protect your laptop and various other accessories from the elements. On your way to the office, or school, or university, or wherever you’re going, you’re usually carrying important stuff. Specific riding bags help here, built with quality materials and clever attachment systems. The bags we’ve selected are versatile and practical. The Ortlieb bags are easily removed with just one hand and the rucksacks offer better visibility, ergonomic straps and great organisation options inside. For a great selection of commuting bags, please go here. Along with bags and clothes there’s a whole lot of other things that are important for an urban transport machine. For one, locks are fairly essential to deter thieves. We’ve picked out a few models for you here. Go here for our article on the right lock for you. As well as locks, helmets or clothes there’s a lot more useful things that you can carry with you in the city. We’ve got a few tips for you. Here’s a selection of a few smart tools you might consider. Commuting puts different requirement on your pedals, than, say, an E-Trailbike. Extreme grip is replaced with the “suitable for any shoe” requirement. We’ve looked at several pedals that use grip tape, like you find on skateboards, or clipless pedals with the mechanism for cycling shoes on one side, and a large platform suitable for everything else on the other. Go here for a selection of pedals. Commuting by E-Bike – what a story. We were amazed by the variety of specialized E-Bikes and accessories on offer for your daily journey through the city. In our Urban Special articles, you’ll find information about E-Bikes, clothing, helmets, bags and more. We did all our photography in Wiesbaden, a pretty place, though sadly designated the “least cycling friendly town in Germany” by the ADFC (German Cyclist’s Association). Riders have to face quite a few challenges in the historic old town. Despite the drizzle and low temperatures, we still managed to have fun doing the shoot. Many thanks to Hotel Alexander in Wiesbaden in Wiesdbaden for helping us out during the photoshoot. How do you get to work? Walking, bus, car, taxi, train, bike or E-Bike?